Most people would agree that dogs are one of the best travel buddies you can have. They add extra life and enjoyment to your trip — but only if you know the essentials you must bring with you to keep your pet happy and comfortable. To ensure a stress-free, memorable trip with your canine, here are six travel essentials you should always have with you while on the road. Like human beings, dogs need nutritious food and clean water to survive. It may seem like a no-brainer to pack these basics, but when you have a lot of things on your mind while getting ready for a trip, you might forget to bring even the most important supplies. When packing food and water for your canine, make sure to place these in easy-access containers. For instance, you can use a reusable bottle with two chambers that allow you to just flip open the lid to dispense food and water. And don’t forget to pack extra in case of emergencies. You don’t want your furry friend getting hungry and dehydrated due to unexpected delays in your trip. Remember that even if you can get access to a different type of food during these unforeseen circumstances, a change in his diet could lead to stomach upset and dehydration, and these are things you will want to avoid when on a car with your pet. 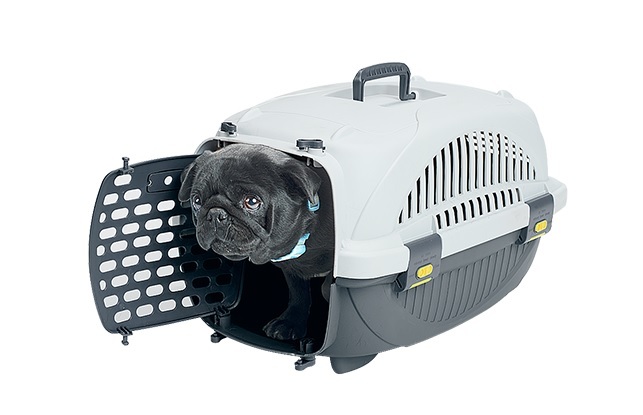 Some dogs don’t want to be crate-trained, but if you plan to travel with your canine often, this is a must. Crates and carriers are some of the safest places for your pet while you’re on a road trip. This will protect him from physical harm in the event of accidents. Also, this will provide him with a place that makes him feel safe and comfortable, especially if you will be staying in an unfamiliar place. Keeping him inside the crate or dog carrier for travel will prevent him from running off and trying to look for his real home and doing any damage to your host’s property. Despite how disciplined your dog may be, you should never let him sit in your car unrestrained. This will prevent him from distracting you while driving. Also, this ensures that he won’t be tossed around the car and injured in case of a sudden stoppage or an accident. One of the best implements that can help ensure your canine’s safety and security while on a road trip is a dog car harness. Make sure to opt for one that is made from high-quality materials and comes in different sizes to guarantee a perfect fit. Also, it should have reflective strips for added visibility at night. Proper identification is crucial, especially if you are traveling. You don’t want your canine roaming around an unfamiliar place without his identification tag in case he gets loose. With the proper ID tag and collar, finding him will be a lot easier. Make sure though to input the correct/updated information in it. Even if a health certificate isn’t a requirement for your travel, it is still highly advised that you have it on hand, along with your vet’s information. This will ensure that your canine is updated on all vaccinations in case anyone asks. Most importantly, this will help ward off needless problems, especially if there are individuals who don’t like dogs who need some reassuring that being around your pet is OK. Your vet’s information, on the other hand, is essential in case something happens to your furry friend while traveling. Your vet can send all your canine’s medical records to the other vet seeing your dog while you’re away from home to make sure that there will be no contraindications with any current medications and other health-related concerns. Your dog can get bored during a long trip. Aside from making frequent stops for short walks, giving him toys will help keep him busy and active. Also, this will prevent him from chewing inappropriate things, especially if you are out on business. Furthermore, bringing some of his favorite toys will make him feel more at home and comfortable. When taking your dog for a trip or relocating with him to a new home, his comfort and safety should be your top priorities. So don’t forget to pack these dog travel essentials to ensure a happy, memorable trip with your furry friend. If you don’t have a dog crate or dog car harness, for instance, now is the best time to make a purchase. Don’t forgo these travel accessories because these small investments will help keep every road trip with your canine safe and stress-free. Andrew Kevan has been the Account Manager at Sandleford Holdings since 2016. He studied at Monash University and completed his Bachelor of Science degree, majoring in Zoology. Andrew is the owner of a beautiful Rottweiler named Lady who is constantly spoiled and loves her Fido & Fletch Large Pet Home.